Properly divided sales territories can make a world of difference for your team and your business. Whether you’re starting from scratch or looking to redesign or expand your existing territory management strategy, there are plenty of benefits to having a comprehensive sales territory plan. Creating a balanced sales territory plan helps ensure you’re targeting the right customers at the right times and assigning the right accounts to the right reps. This also allows you to reduce your sales costs and improve productivity – which hopefully leads to even more sales. What is a sales territory? Traditionally, a sales territory refers to a geographical area assigned to an individual salesperson or team. However, a more modern definition encompasses sales territories created around certain types of customer and audience segments. For example, other characteristics that can be used to define a sales territory include sales potential, industry, product, customer type, purchase history, and referral source. 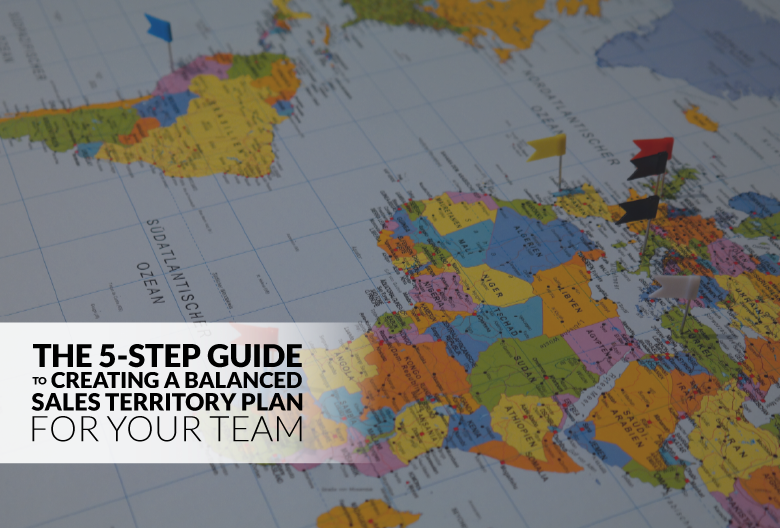 If you struggle with sales territory management or your current territories are unevenly serviced, follow this step-by-step guide to put together a better sales territory plan for your sales team. Before you can develop an effective sales territory plan, you need to take stock of your existing clients, prospects, and leads. Start by dividing your customers into segments based on location, vertical, purchase history, or another relevant characteristic. Take note of which verticals your team is experiencing the most success with, where they’re located, and how they’re making purchases. For example, does this type of customer buy online with minimal relationship nurturing? Or do they often require an in-person demo to convert? If possible, pick out your top ten prospects or customers and identify any common characteristics they share. What are your customers buying? Are certain solutions, services, or products outperforming others? Why are your customers buying? What pain points does your offering solve? Which events lead to purchases? Which events lead prospects to not buy? What is your conversion rate? Where do conversions tend to drop off? Answering these questions will help you spot overarching trends in the market and better segment your territories. Next, complete a basic SWOT analysis to clearly identify your team’s strengths, weaknesses, opportunities, and threats. What is your team good at? Where do your sales reps excel? Maybe some of your team members deliver awesome in-person demos, while others work best over phone and email. Is there a particular stage of the sales process where leads tend to lose interest? Are there any bottlenecks or leaks in your pipeline that must be addressed? 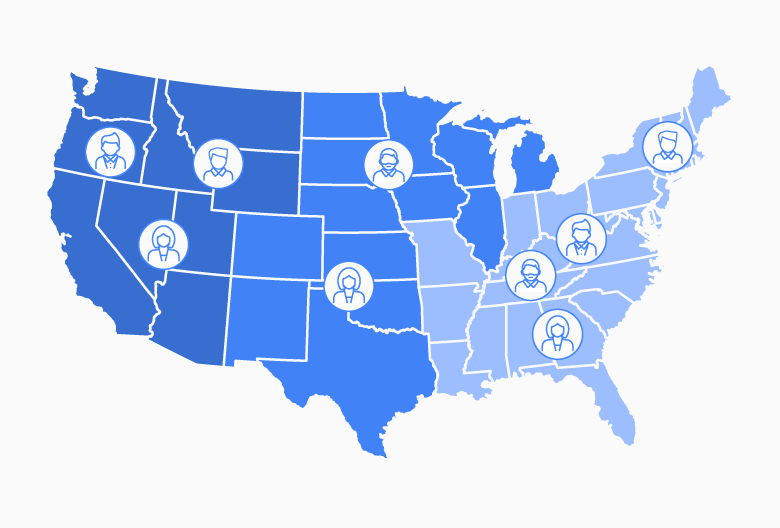 Based on the current marketplace and your customer segments, is there an untapped market or under-serviced territory that more of your reps should sell to? What are the biggest threats to your success in a given territory? Is there a competitor fighting for the same market share in a particular vertical, location, or customer segment? Whether you’re mapping out a new territory management plan for the whole team or redefining a specific rep’s sales territory, it’s always best to set clear parameters and tangible goals. The easier your goals are to measure and track, the better. Looking at our sales pipeline coverage, how many new opportunities do we need to add to meet quota? Where are most of our new leads coming from? Which geographical regions should we focus on? Are any of our territories being underserviced? If so, how many reps should we assign to those territories? Which products are the most profitable? Which customers are purchasing them? Which customer segment offers the highest payoff? Are we tapping into that value consistently? Now that you have clear customer segments and goals, you’re ready to create a plan with your reps to target the most lucrative segments and get the most coverage possible. Assign individual reps to specific regions or markets. Use the information you collected in steps 1-3 to take sales potential into consideration to ensure even distribution. Try to match team members’ skill sets to the type of territory you assign them. If one of your reps has already established relationships with prospects in a particular territory, try to give them jurisdiction over those accounts. Looking at your customer segments, decide how often different types of accounts should be contacted. Look at whether or not they require in-person visits to be handled by field reps or whether most of your accounts can be handled remotely. What resources do you reps need to manage the accounts assigned to them? What else does your team need to succeed in reaching the goals and milestones you’ve set for them? How will you boost conversions in each territory? Are there opportunities to further penetrate underserviced territories? The last (and longest-lasting) step is putting your new sales territory plan into action. It’s important to continually measure your progress to see how your new territory plan impacts sales. For instance, have sales increased in a specific region or market? Is there a large disparity between sales in different territories? Is one rep struggling to keep up with leads while another is barely meeting their quota? Is there a market that seems underserviced that needs additional reps assigned to it? If any of your territories or reps are underperforming, make an effort to find out why and implement adjustments as necessary. Sales managers can maintain even territory distribution and set their reps up for success by adhering to the following best practices. 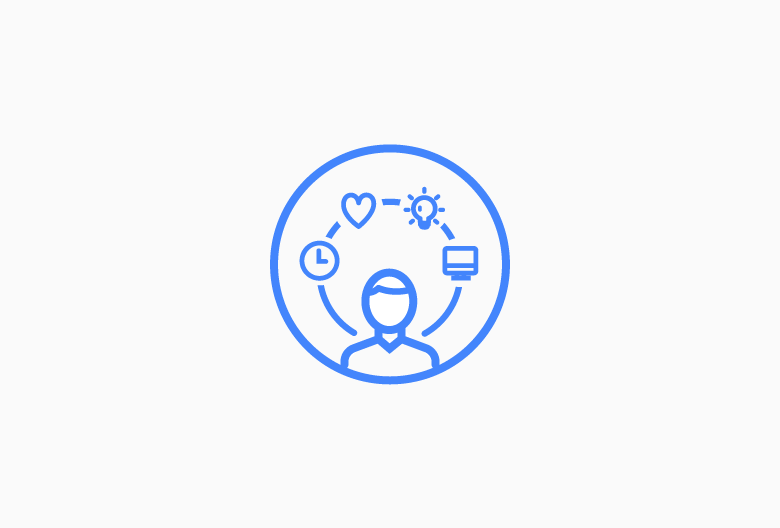 Create a call rotation schedule so you can keep in touch with all your accounts. Determine how much contact each account requires to determine how often your reps should reach out. Consider whether the customer requires a physical meeting to renew their contract or can be managed over the phone. 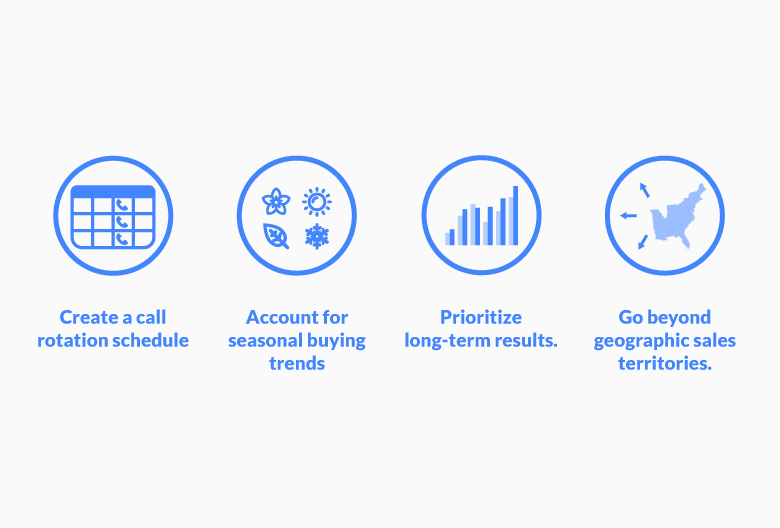 Account for seasonal buying trends so you always contact the right territory at the right time of year. Reach out when your customers are most likely to be ready to buy again. Prioritize long-term results. Although it’s important to address fresh leads whenever they come up, you shouldn’t let unqualified opportunities distract from the big picture plan. Encourage reps to stick to their call schedule even when new leads appear. Go beyond geographic sales territories. Depending on what you’re selling and who your targets are, dividing up leads by geography might not be the best choice – especially if your reps don’t usually travel to meet clients in person. In many cases, it makes more sense to divvy up customers by industry, referral source, product, or account size. Looking for a CRM that works great with Gmail? Thank you! Please confirm your email address by clicking on the link we just sent you. Free 14-day trial for the whole team. No credit card required. © Propeller CRM, Inc. 2018. All Rights Reserved. © Propeller CRM, Inc. 2016. All Rights Reserved.